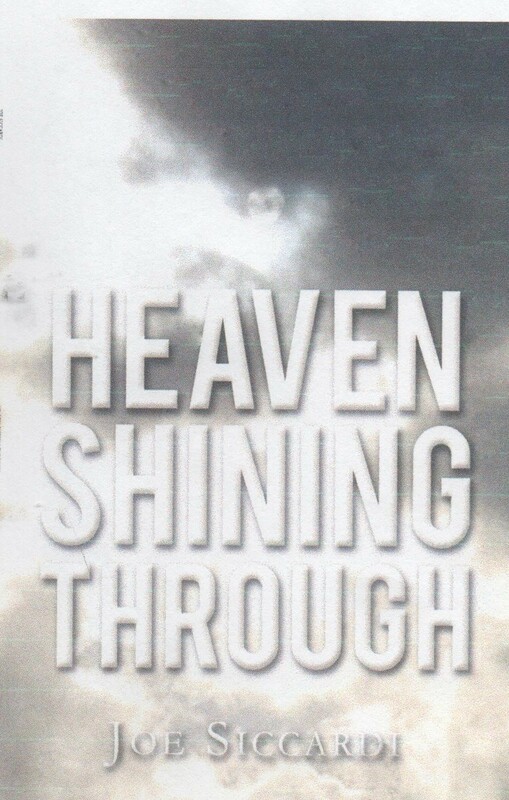 My book, Heaven Shining Through, is inching closer and closer to reality. The galley proof has been sent back and I updated the cover design. While I’m getting excited about adding “author” to my resume, I share this because you, readers, were very much a part of this venture right from the start. Thus, I want to keep you in the proverbial loop. 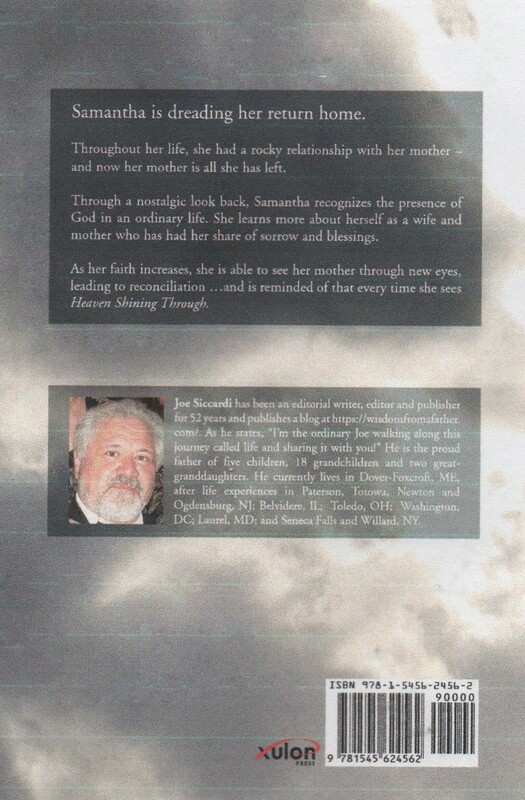 The underlining theme of the book is the restoration of a relationship between Sam and her mother. It was told through the prism of a flashback to Sam’s life — her early home experiences, her wilder side, meeting the love of her life, Chad, her growth as a wife and mother through sorrow and blessings, and the presence of God in an ordinary life. I tried to keep it real with appropriate language and activities. I purposely stayed away from being “preachy” but rather told a story that showed the presence of God in everyday, sometimes messy lives. The hope is readers will be able to see that. A lot of the activity takes place in the greater Paterson, NJ area, which, of course, is where I called home as a youth. Some of the backdrops will be familiar to fellow Patersonians who grew up in the mid 60s. I haven’t coordinated a launch date yet … that should be coming soon. I know it will be available online and I am planning book signings and presentations, at least in Maine, New York and New Jersey. I’ll keep you posted as they develop. In the meantime, you can pre-order a copy of Heaven Shining Through simply by commenting and/or e-mailing me at revblt@rochester.rr.com. I will get back to you when the book becomes available. No upfront charges will be made. I have also launched a funding page at FaithLauncher, https://www.faithlauncher.com/projects/3320-heaven-shining-through, which will help determine the original print run. This entry was posted in Readin', Ritin' & Rithmetic and tagged book, communication, DPchallenge, encouragement, entertainment, faith, family, friends, God, Heaven Shining Through, joy, life, love, Memories, novella, Paterson, planning, relationships, stories, writing. Bookmark the permalink. Hoorah! Send you a photo from Don Bosco Prep and the Feb 2 Mass and gathering of DBT DBP alumni. 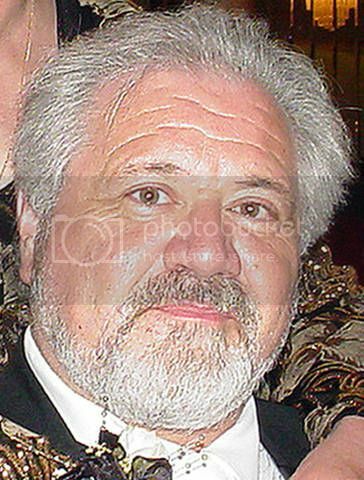 Hope to get invited to Book signing NJ NY or somewhere I can buy. Exciting news for you! Congrats on the completion of the writing! Best wishes for success. Past several months have been redrawing 500 cartoons for a self publish effort. Taken 6 months, maybe 30 more now. And to you too. I often share your comical takes on life with family and friends. Delighted to hear that. It’s why I keep it clean, hokey, unoffensive for an audience and don’t do political commentary. Some people have asked me to send uncolored ones so their grandchildren can color them. That’s heartwarming.